Palmer Enamel" and "Hanley". Overglaze black printing was often called enameling in the late 18th century pottery industry of North Staffordshire. Humphrey Palmer who made this canister is traditionally said to have employed the engraver Thomas Rothwell from about 1765-1773 and he is generally thought to have been responsible for the prints on this piece, However recent research has shown that Henry Baker was the chief printer for Palmer at this time and the engraving for the print is likely to be his work, or work done under his direction. 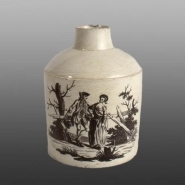 Tea canister, creamware, cylindrical shape with rounded shoulder and decorated with black transfer prints of rural lovers. On one side is a print of a woman tickling her sleeping lover, the print is inscribed along the bottom of the scene with clumps of grassy foliage separating the words "Palmer Enamel" and "Hanley". Overglaze black printing was often called enameling in the late 18th century pottery industry of North Staffordshire. Humphrey Palmer who made this canister is traditionally said to have employed the engraver Thomas Rothwell from about 1765-1773 and he is generally thought to have been responsible for the prints on this piece, However recent research has shown that Henry Baker was the chief printer for Palmer at this time and the engraving for the print is likely to be his work, or work done under his direction.